While salt may make for a crave-worthy potato chip, too much doesn’t do a body good—and you know most Americans currently are consuming way too much. “According to the American Heart Association, over 50 randomized trials have been conducted showing that as the intake of dietary sodium levels increases, so does blood pressure,” says Janet Bond Brill, PhD, RD, LDN, CSSD, a cardiovascular nutritionist, the author of Blood Pressure Down and Prevent a Second Heart Attack, and a Go Red spokesperson (see recipe here). To be clear, however, the consequences stemming from high salt intake don’t end but begin with hypertension. “The harm from excess sodium intake goes far beyond blood pressure,” Brill says, noting that in addition to being a major risk factor for cardiovascular disease, which still is the leading cause of death among both men and women, high salt intake boosts the risk of conditions such as proteinuric kidney disease, hypercalcemia, urinary stones, arterial stiffness, and osteoporosis. With one in three Americans currently diagnosed with hypertension, according to the Centers for Disease Control and Prevention (CDC), you can conclude that excessive salt consumption is a widespread problem. What does that mean for the average American? It means cook more and consume less salt. “Fresh and prepared at home is best, when possible,” says Sonya Angelone, MS, RDN, CLT, a spokesperson for the Academy of Nutrition and Dietetics. The trouble is most clients don’t cook at home most days of the week. And if they do, they still may throw a frozen pizza in the oven and count it as one night’s dinner. But while most people aren’t used to cooking most weekdays, it’s a skill they can learn. 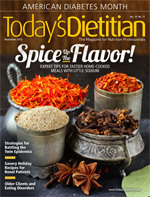 Today’s Dietitian interviewed expert cooks and dietitians specializing in cardiovascular health who offer tips on what foods clients should avoid, how they can begin cooking more at home, and ways to pump up the flavor of their favorite foods without adding salt. First up in getting clients to consume less sodium is a little education on the source of their salt habit. “Step one should be to educate patients on the top 10 food sources of sodium in the American diet,” Brill says. “People understand food, not milligrams. “Almost half of the sodium we eat comes from only 10 types of foods,” she explains, referencing a recent CDC study that found 44% of Americans’ sodium consumption comes from the categories of bread and rolls, cold cuts/cured meats, pizza, poultry, soups, sandwiches, cheese, pasta mixed dishes, meat mixed dishes, and savory snacks. In addition to educating clients on these high-salt culprits, “Suggest substitutions or livable options, such as cutting down on the number of pieces of bread consumed or purchasing lower-sodium brands,” says Brill, who also stresses to clients that while 65% of sodium comes from processed foods, another 25% typically comes from restaurants. “So consume more fresh and whole foods and eat out only once per week,” she says. Next comes the real education that will make a low-sodium diet more feasible for clients: cooking tips. In addition to suggesting low-sodium recipes, encourage them to focus on what they’re adding to a dish to give it more flavor instead of what they’re losing—namely the salt. According to Robin Plotkin, RD, LD, a culinary nutritionist based in Dallas, one (or all) of three things can almost always be added to a dish to add flavor in lieu of salt: citrus, vinegar, and/or spice (see recipe here). According to Michelle Dudash, RDN, a Cordon Bleu-certified chef and the author of Clean Eating for Busy Families, meals generally turn out better when clients know what flavor profile they’re going for before they start (see recipe here). “In general, when seasoning foods, think about the end goal, not necessarily about whether it’s an entrée or vegetable,” she says. “For example, if you’re making an Italian-inspired meal, most dishes can benefit from parsley, garlic, basil, oregano, and red wine vinegar. How can clients determine which flavor profile to shoot for? Elaine Good, a personal chef specializing in organic gluten-, dairy-, and sugar-free cooking and who developed her own line of powdered seasonings called Herblends, suggests clients flip through a cookbook similar to the type of food served at their favorite restaurant “and look at the ingredients used for seasonings, and you’ll see the flavor profile you like,” she says. Fresh lemon or lime juice and chopped fresh dill and garlic are fabulous with all types of fish dishes, Brill says, adding that balsamic vinegar, “especially the well-aged sweet variety,” is an absolute must for salads. Plotkin recommends rosemary for chicken, steak, and potato dishes, and suggests having cinnamon on hand for oatmeal, baked goods, and baby food. In addition to experimenting with various herbs, there are other ways to spruce up flavor. An apple fruit-infused vinegar, such as one made by Mangé, pairs great with pork and a strawberry variety goes well with chicken, according to Ficek. For clients craving some crunchiness, Dudash recommends stirring chopped nuts into a chicken or fish breading as well as garlic and onion powder for flavor without the salt. Vegetables: Margaret Pfeiffer, MS, RD, CLS, a practicing cardiac nutritionist and the coauthor of the recently released Indian Inspired Gluten-Free Cooking, says vegetables are a great place to start experimenting with a little spice. “Bring them alive with a bit of oil and spices,” she says, recommending chopped fresh sage with zucchini and fresh tarragon on steamed green beans. “A great savory spice mix for vegetables includes cumin, chili powder, paprika, pepper, garlic powder, onion powder, and red pepper flakes,” Gilley says. Brill says curry can add a ton of flavor to any vegetable dish. And she likes to roast her favorite veggies with extra-virgin olive oil and balsamic vinegar. “You’ll never miss the salt,” she says. After cooking, Dudash suggests a spritz of fresh lemon juice or a splash of vinegar for a flavorful finish. “Enjoying seasonal produce tastes better than produce that’s been sitting around for a long time, so you don’t have to manipulate it with as much salt,” she adds. Rice and beans: Washing canned beans before using can significantly decrease the salt content. “Be sure to rinse your canned beans until they no longer foam up,” Plotkin says. Pasta: How can clients keep pasta tasting great without adding salt? There are multiple ways to do it, but Gilley says adding any fresh herb mixed with fresh garlic, fresh lemon juice and zest, olive oil, pepper, and a little mustard works nicely on almost any pasta. When a dish without cheese just isn’t in the cards, Plotkin says using high-quality ingredients can go far to reduce sodium. It’s all in how much you use, she says: “Using a high-quality Parmesan cheese adds a ton of flavor, and yes, some salt. But using these strong, high-quality cheeses means you don’t need to add as much cheese [and salt] to the dish,” Plotkin says, noting that although it’s recommended, adding salt to water in which the pasta is cooking isn’t necessary. “For a low-sodium version of macaroni and cheese, replace half of the cheese with roasted and mashed acorn squash,” Plotkin adds. To top it off, Plotkin suggests making an herb topping for a flavorful finish. “Top soups and stews with fresh cilantro or basil, depending on what flavor profile you’re going for,” she says. Desserts: Because premade bakery items can harbor large amounts of hidden sodium, clients are better off baking their own. “When baking, use vegetable oils, substitute avocado for butter, use fresh/dried fruits, honey, jam, jelly, and yogurt,” Plotkin says. When that’s not possible, she says sorbets, sherbets, frozen dairy desserts and, of course, fruit, are clients’ best low-sodium sweet treats. “If chocolate is in order, you could have a couple squares of Ghirardelli dark chocolate—0 mg of sodium per serving,” Brill says. It seems a regular home-cooking routine may be the best prescription yet for high blood pressure and all its dire consequences. 1. Preheat oven to 450˚F. Remove tofu from the container and drain. 2. Place several paper towels on a plate. Set the tofu on the paper towels and put several more paper towels on top of the tofu. Place a heavy plate on top of the tofu to press the excess moisture out of the tofu. Cut the tofu into 1-inch pieces and combine with the cauliflower. Set aside. 3. In a large skillet, heat the oil over medium heat. Add the onion and cook, stirring until golden brown, about 5 minutes. Stir in the curry, ginger, cumin, and salt-free seasoning blend to coat the onions. Mix the curry and onion mixture with the cauliflower and tofu. Stir gently to combine. 4. Spray a baking sheet with nonstick cooking spray. Spread the tofu and cauliflower in a single layer on the sheet and bake, stirring occasionally, for about 30 minutes or until the cauliflower is tender. Serve over cooked brown rice. 1. Cook quinoa according to package directions, replacing the water with Welch’s 100% Grape Juice made with Concord grapes. 2. Transfer cooked quinoa into a large bowl. Add cheese, nuts, olives, and chickpeas. Stir gently. Add juice from 1 lemon and parsley. Stir gently. When serving, add remaining parsley for garnish. Serve warm. “I finally discovered the perfect dipping sauce for sweet potatoes in France, where the French dip traditional fries in mayonnaise instead of ketchup,” says Michelle Dudash, RDN. 1. Preheat oven to 450˚F and line a large sheet pan with a silicone baking mat or parchment paper coated with canola oil spray. 2. To make the fries: Toss sweet potatoes with oil, rosemary, pepper, and salt and spread them out in a single layer on the sheet pan. Bake on the bottom rack of the oven until golden, about 30 minutes, turning them and rotating the pan after 15 minutes. 3. To make the aioli: Stir together mayonnaise, yogurt, lime juice, curry powder, and garlic powder in a small bowl. 4. Serve the fries with the aioli.